This is a classic ornament handmade by artists at the Glass Eye Studio in Seattle, Washington. The glass is recycled and contains ash from the 1980 Mt. St. Helen's eruption. This piece has textured ribbing that swirls around the ornament. 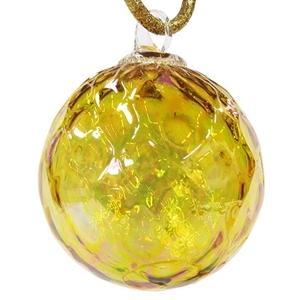 It is an iridized transparent yellow. Its diameter is approximately 3 1/8". Bruce Troeh - "Softball Marble"
Hot House Glass - "Dark Purple and White Swirl"